Knife Making Quik Tip (Quenching temp) Magnet test. 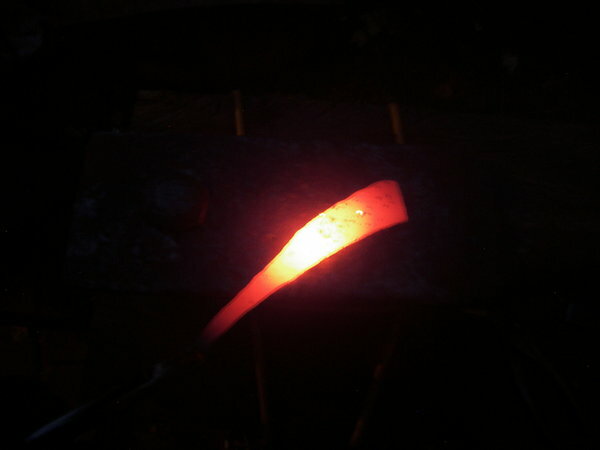 When heating your blade the general rule is cherry red means it is ready to quench, however if you want to be more exacting with the temp you can try using a magnet. When your steel reaches red/orange test it with a magnet. If it is no longer magnetic it is ready to quench. A useful tip especially when using more technical steels that might require more heat to quench harden. This entry was posted on July 31, 2011 by .. It was filed under Knife making-Blacksmithing and was tagged with Blacksmith, blade smith, iron temp, iron work, Knife making, magnet test, metal work, oil quench, quenching iron, quenching temp, steel temp, tempering, water quench.